The closing concert of the season 2017 / 2018 will be played by the italian piano duo Monti Bianco. Both musicians come from considerable experience both as soloists and as chamber musicians, yet they have discovered in a brief space of time that they are able to unite their musical talents in a highly natural manner. The Duo Monti & Bianco is first prize winner at the prestigious international piano competition in Rom / Italy and regularly invited to perform at Musical Season and Festival throughout Italy and Europe. Piano Recitals in Concert halls and international music festivals in Naples, Rom, Ischia, Florence, Trieste, Munich, Lugano, Mantova or Rogaska Slatina are celebrated by the international press. The opening Concert of the season 2017 / 2018 will be played by the chinese Steinway Artist Zhao Ling. Born in a pianist family, Zhao Ling was greatly influenced by her parents – Ling Yuan and Zhao Pingguo who are both renowned pianists. After her graduation from the Central Conservatory of Music (CCOM) with distinction, she was admitted to University of Music and Performing Arts Munich, Germany where she obtained her Ph.D., and further extended her career as a teaching faculty member for more than a decade. Zhao Ling has been very active on the world stage with a wide-range repertoire. She has given solo recitals in many prestigious concert halls among many major cities in the world, including China, Germany, France, Austrian, Italy, Spain, Switzerland, and the United States. On many occasions, she has performed with world’s major ensembles and orchestras, including Bonn Philharmonic Orchestra, Beckham Symphony Orchestra, Beijing Symphony Orchestra, Munich Philharmonic Orchestra, Tianjin Orchestra ect. Alongside her solo career, Zhao Ling is a dedicated player of chamber music. She is also greatly in demand as partner to various instrumentalists and singers. Werke von H. Cowell, J. Thomas, P. Glass u.a. Mit „Himmlischen Klängen” verzaubert die preisgekrönte Harfenistin Floraleda Sacchi aus Italien ihr Publikum im ersten Konzert von Montjoie Musicale in der Pfarrkirche St. Mariä Geburt in Monschau. Von Musikkritikern als „Künstlerin mit außergewöhnlicher Musikalität und Talent“ beschrieben, ist Floraleda Sacchi mittlerweile eine gefragte Solistin auf der ganzen Welt. CD-Aufnahmen bei großen Musikunternehmen, wie Decca, Universal, Philips und Deutsche Grammophon dokumentieren ihren beeindruckenden künstlerischen Werdegang. Regelmäßige Gastspiele in der Carnegie Hall (New York), im Gewandhaus (Leipzig) oder im Konzerthaus in Berlin sind jedes Mal ein musikalisches Erlebnis. J. S. Bach, M. Ravel et. al. Saxophone vs. Piano! 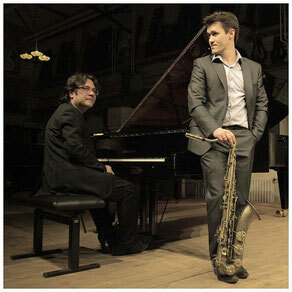 With the Duo Andrey Lakissov (sax) and Ulugbek Palvanov (piano) Monschau will have an unforgettable concert evening by Montjoie Musicale. Andrey Lakissov is one of the leading saxophonists of his generation and as a regular guest at international festivals all over Europe he combinate classical with world music unique way. His piano partner Ulugbek Palvanov has received various awards including, prizes at International Piano Master Arthur Rubinstein Competition in Tel Aviv / Israel, Robert Schumann Piano Competition in Zwickau / Germany, Steinway Competition in Berlin / Germany, International Piano Competition Busoni / Italy and International Piano Competition in Porto / Portugal. As a passionate chamber musician Ulugbek Palvanov regularly works, beside his projects with Andrej Lakisov, also with colleagues like Tschaikowsky Prize Winner David Yonan or Ramon Jaffé. W. A. Mozart, P. I. Tschaikowsky et. al. Russian Composer will be the main part of the program an played by one of the world leading chamber orchestras. Founded in 1953 as a Radio Zagreb ensemble under the artistic leadership of the renowned cellist Antonio Janigro, Zagreb Soloists gained reputation as one of the world’s most outstanding chamber orchestras. Since 2012 the ensemble performs under the leadership of Sreten Krstic who is also the leader of the Munich Philharmonic. Since their inception the Zagreb Soloists gave over 4000 concerts on all continents and in many prestigious venues such as the Musikverein (Vienna), Concertgebouw (Amsterdam), Royal Festival Hall (London), Berlin Philharmonic Hall, Tchaikowski Hall (Moscow), Santa Cecilia (Rome), Carnegie Hall (New York), Opera House (Sydney), Victoria Hall (Geneva), Teatro Real (Madrid), Teatro Colon (Buenos Aires), etc. The soloist of the evening will be the bulgarian pianist Ivan Donchev. Music critics describe him as “refined” (“Qobuz Magazine”, France), “full with temperament” (“Darmstadter Echo”, Germany), “gifted with impeccable technique and remarkable ability to excite” (“Il Cittadino”, Italy). He has performed as a soloist in most of the major European cities and concert halls and has regularly toured in Europe, Asia and America. His records include broadcasts for RAI 3, Radio France, Radio Classica, BG National Radio and TV. J. S. Bach, C. Reinecke et. al. 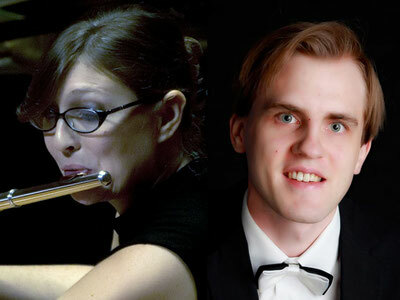 Baroque and Romantic Flute Masterpieces will be played by two extraordinary musicians Laura Trainini and Florian Koltun. 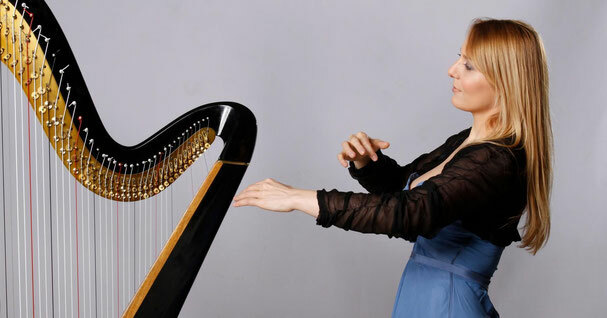 Since 2011 The italian flutist Laura Trainini is the principal flutist of the Wuhan Philharmonic Orchestra, beeing the first foreign musician invited as expert by the Wuhan City Government. She worked as principal flute in the Chihuahua State Philarmonic Orchestra (Mexico), Orchestra of National Music School in Mexico City, Toluca Philarmonic Orchestra (Mexico), under the guidance of many conductors, as Vittorio Parisi, Silvio Baracco, Armando Pesqueira, Sergio Cardenas, Placido Domingo, Jacob Chi, Liu Peng or Eduard Topchjan. She has made recordings for the Mexiquense Radio and Television and Italian Television with music by Teleman, Varese, Debussy, Stravinsky, Ravel. The german pianist Florian Koltun is prizewinner of diffrent piano competition in Germany, Spain, Italy Netherland and Luxembourg. He is regularly a welcome guest at diverse well-known concert places in Germany, Belgium, Netherland, Italy, France, Spain or China and performed recitals in prestigious places such as the Alte Oper Frankfurt, Berliner Philharmonie, Thürmer-Saal Bochum or Schloss Koethen. The second piano recital will be played by the Montenegrin master pianist Ratimir Martinović. 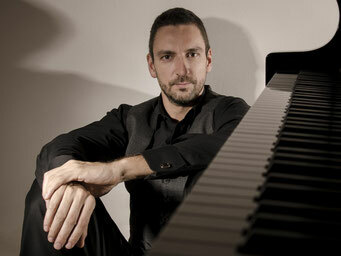 The ideal combination of intellect, technique and passion, refinement of touch, perfect technique, concentration and control, exceptional dynamic potential, original ideas and unconventional interpretations« give Ratimir Martinovic, by the critics' words, one of the leading places among pianists of his generation. Since his twelfth year he has played in over seven hundred recitals, chamber music concerts as well as with orchestra in almost all European countries, United States, Mexico, Canada, Argentina, Brazil, South Korea, China, Japan, Thailand, Russia, Ukraine and elswehere. Concerts in New York (Stern Auditorium at Carnegie hall), Rome (Auditorium Parco della Musica), London (St. John Smith Square, St. James Piccadilly), Shanghai (Oriental Art Centre), Seoul (Seoul Art Center), or Prague (Rudolfinum, Smetana hall) was honard by the main press critics. Martinović is the founder and member of KotorArt Trio, together with violinist Roman Simovic (concert-master of London Symphony Orchestra) and clarinetist Aleksandar Tasic (solo clarinetist of the Verbier Festival Orchestra). He has also played chamber music with cellists Misha Maisky and Kirill Rodin, among others. Chamber Music "Ovations by Yury Revich"
The russian violinst and Echo-Klassik Prize Winner Yury Revich will be again presenting a special event in Monschau. 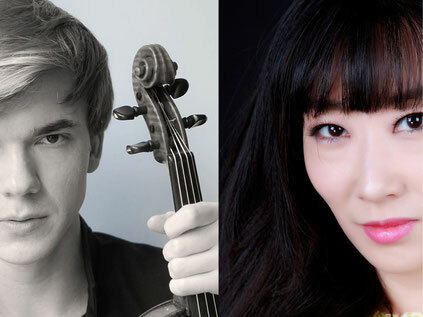 Together with the chinese pianist and artist director of Montjoie Musicale Xin Wang they will play virtuose composition by Tartini, Mozart and Sarasate. With the project "Ovations by Yury Revich" they will give also young talented musicians the possibility to play in public. In his twenties, violinist Yury Revich is already a multi-faceted artist of incredible depth and maturity. Winner of an ECHO Klassik 2016 “Newcomer of the Year” award, “Young Artist of the Year 2015” at the International Classical Music Awards and “Young Musician of the Year” by the Beethoven Center Vienna, he is one of the most expressive and versatile musicians of his generation. Yury made his debut at Carnegie Hall in 2009 and La Scala in 2013 and his concerts since then have included performances at the Berlin Philharmonie, Vienna Musikverein and Tchaikovsky Concert Hall Moscow amongst many others. The chinese pianist Xin Wang established herself in spite of her young age as one of the leading pianists of the inner Mongolia / China. She is regularly a welcome guest at diverse well-known concert places in Europa and Asia like Berliner Philharmonie, Schloss Elmau in Germany, Qintai Concert Hall in Wuhan, Concert Hall in Xiamen, Henan Art Center in Zhengzhou, Concert Hall in Ningbo, Poly Grand Theatre in Hohhot and many others.